If you want to judge with some degree of certainty how a particular bullet will perform on game within a certain velocity range, the surest method is to test it yourself. Handgun hunters who use specialty pistols such as Thompson/Center's Encore and Contender often must use bullets designed for velocities outside the range of those generated by handguns of these types. Cartridges designed for revolvers produce higher velocities in the closed breeches and longer barrels of these specialty pistols, and bullets must be selected carefully to ensure that they do not come apart on impact at these higher velocities. The author tested these Barnes TSX 6.8mm bullets in wet newspapers at various velocities to determine maximum effective range on deer-size game. The TSX is an excellent bullet at rifle velocities, but as it turned out it was not the best choice for the slower velocities of the 6.8mm SPC in a handgun. By contrast, even the 14- and 15-inch barrels in use now with the T/C handguns produce considerably less velocities with rifle cartridges than the bullets may have been designed for, and care must be taken to ensure that the bullets will expand properly, especially at longer ranges. While there is a plethora of information and terminal test data available on self-defense handgun loads, little is offered on handgun hunting loads. Some bullet manufacturers offer basic information on expansion characteristics and optimum velocities, but if you want to judge with some degree of certainty how a particular bullet will perform on game within a certain velocity range, the surest method is to test it yourself. Ballistic gelatin is used by experts in both the private and government sectors to test and compare bullet expansion and penetration. Gelatin is fairly expensive, though, and it's time-consuming to use correctly. The handgun hunter can fare quite well with less expensive and easier methods. We do not need to meet exact scientific standards. 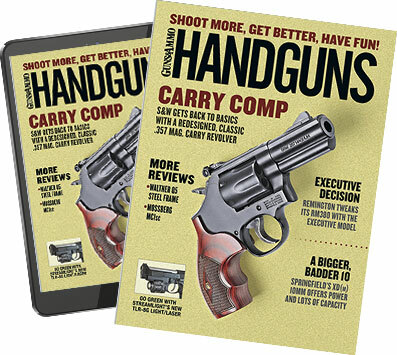 The goal of the handgun hunter is simply to compare various bullets and determine within a reasonable margin of error which best suits his needs. All we truly need to know is whether the bullet will expand at the impact velocities likely to occur and how well it will remain intact and penetrate at these velocities. There are two simple and time-honored methods for testing bullets in your backyard or at the range. One is to test in water, using containers of some type lined up in a row of sufficient length to stop the bullet. I use one-gallon milk and water jugs that I save as they are emptied. The other method is to soak newspapers in water until they are thoroughly saturated. While neither method will always tell you exactly how a bullet will perform in flesh, both will allow you to compare one bullet to another and set some standards of performance that, with experience, will allow you to predict a bullet's performance on game with a fair degree of accuracy. Some backyard ballisticians only test at near muzzle velocity. This is a mistake. To accurately guesstimate how a bullet will perform downrange it must be tested at downrange velocities. This can be done by setting up the tests downrange and firing at various distances--easy enough if you have a couple-hundred-yard range in your backyard, but it can be a hassle at a public range. A concern when using bottleneck rifle cartridges in handguns is that velocities can be fairly low even a couple of hundred yards downrange. Some rifle bullets only expand completely above 2,100 fps. When you start the bullet out at short barrel velocities of perhaps 2,400 to 2,600 fps, the bullet doesn't have to travel far to drop below velocities required for optimum expansion. This is why lighter rifle bullets with thinner jackets often work best at handgun velocities. Testing bullets in any substance is not an exact science. Water, wet newspapers and gelatin offer consistent resistance throughout the bullet's path. Animals do not. But you can learn a lot from testing if you know what to look for. Basically, you are looking for three things. Does the bullet expand completely? Does it retain weight and penetrate sufficiently? And at what point does expansion occur? Judging expansion is easy. Either the bullet expands or it doesn't. You can measure the expanded bullet with calipers, and if expansion is twice the bullet diameter, smile and be happy. You can also weigh the expanded bullet and determine the amount of retained weight. As much as high weight retention is touted by some, I have found that some weight loss is not only acceptable but desirable for certain game. With medium game such as whitetail deer, handgun bullets that expand rapidly and shed some weight just seem to kill quicker in my experience. You still need enough retained weight to penetrate reliably, but do not get hung up on searching for 95 to 100 percent weight retention. High weight retention is, of course, desirable on larger, tougher game to ensure deep penetration. You can judge how quickly and at what point a bullet expands by looking at the wound channel in wet newspapers. You can judge this to a lesser degree in water jugs. I number the jugs and then examine each after shooting. The jug with the most damage is where the most expansion occurred. This is usually the first jug, but it may be the second or third if the bullet is designed for slower expansion. You can also look at entry and exit holes on each jug and get a good idea of how much the expanded bullet diameter was at those points. Judging whether the bullet provides enough penetration is the most difficult aspect of testing. Here is where a control bullet is most useful. If you have a bullet that has performed well for you on the game, fire it into the test medium at various downrange velocities and use it as a benchmark upon which to judge other bullets. y. Likewise, if the bullet breaks apart in these substances it will almost surely break up on game, especially if bone is hit. Testing your bullets is easy and a lot of fun and could prevent a lost wounded animal. If you test a variety of bullets on an ongoing basis you will gain experience as to how various bullets perform and will become more adept at judging a bullet's potential based on these tests.